Part of Aikido technique is causing uke to want to move. (Or, in the vernacular, "messing with his mind.") When uke holds with firm but neutral energy it is difficult to do tenkan as there is nothing to work with. With no flow, there is nowhere to go. But nage can change the equation with a tiny, almost invisible motion that draws uke's mind. Uke seizes nage's wrist firmly but with neutral energy. Nage attempts tenkan and observes any difficulty. 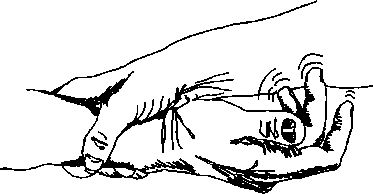 Nage strokes underside of uke's wrist then turns tenkan. Observe the degree of difficulty in the two tenkan motions. In Aikido, tiny beginning motions are behind many big results. A backward roll begins not by flinging back the head but by a subtle rounding of the pelvis. The Spinning Exercise (page 75), it is difficult to turn and change direction of the spin or even with One-Point Begin the motion with a finger that acts like a little starter motor.